In the past, I've always entered to compete in various forums. I won some and lost many, but it actually did make me a better artist. It is true. Every time I entered the contest, I am always pushing myself to the next level. There are a lot of time I fall on to second, third, or forth. I am always looking forward to the next round so that I can again stand among giants. I always get inspired by so many of my competitor's entries. They are soooo good. And now, I want you to get the same experience and I even give you incentive to try to win. Back then, there were no prize, just stars. There are some forums that offers prize but the contest goes for like half a year. I am not really good at spending a lot of time on one piece, plus there is so much work...sometimes I forgot to continue. So bi-weekly is a good amount of time to do some decent work in my humble opinion. Go and register and compete in the arena among your artist friends and foes. 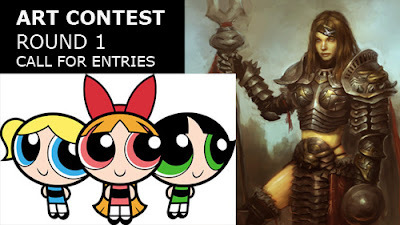 Re design or re create one or all of the PowerPuff Girls into a Gladiator! They are all grown up now too so try to put them all in a semi-realistic rendition. Put her into a well thought out armor design in action or relax pose to fit the fantasy world (could also be dark and gritty, up to you, use your imagination. Final piece can be color or black and white render, just do the best you can do. Three of idrawgirls PREMIUM TUTORIALS!!! Wednesday APRIL 13th, 2011 at 12:00 AM PACIFIC STANDARD TIME. Watch or Read How to post image on ArtistsArena.org You only need to watch this once, then you are good to go forever. I just want to thank you for all of you who support us whether by purchased our Premium Tutorials or Donated. Other than you can learn more things from the premium tutorials you also get Karma points because we would not have come this far without your support. And we will keep going further and further to put out the best art video tutorials we can FREE and premium alike. Our priority mission is make you the better artist so ArtistsArena.org will be another branch to support your and our goal. Thank you, you know who you are.